Tomorrow bright and early a bunch of Bay Area cyclists and I are going to bike the math of climate change to Chevron’s shareholders and call for the company to be a part of the renewable energy future rather than be the unsustainable, fossil foolish, retro backwards 20th century dinosaurs they are right now. 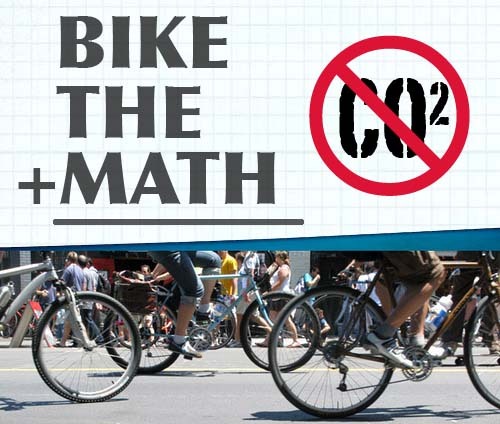 I wrote about how this all came about in Don’t just count the carbon, BIKE THE MATH!. But really, what makes this story so powerful is how it highlights how everything is connected and how this one mega oil company represents all that is wrong with the way things are. From greed, shortsightedness and exploitation to political corruption, externalized costs, environmental destruction and social injustice, Chevron is one of those entities that are at the core of a planet out of balance with all the pain and suffering that entails. So here are the specs for our bike ride tomorrow, and below some impressions from today’s press conference that brought together a powerful coalition of people who will be gathering in- and outside tomorrow’s shareholder meeting to hold this rogue behemoth accountable for its actions and bring attention to the true cost of Chevron. Gayle McLaughlin, the mayor of Richmond, CA talked about Chevron’s unwillingness to take responsibility in the aftermath of a fire at Chevron’s Richmond, California refinery that sent 15,000 people to the hospital. 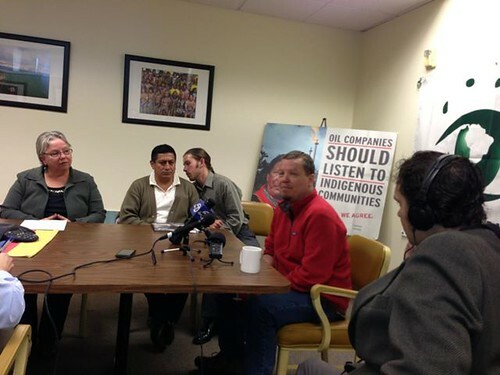 Rather than fix the aging pipes in their refinery and address worker’s rights issues in Richmond, Chevron is dumping millions of dollars into local elections to install their cronies on the Richmond City Council. McLaughlin said they finally had to establish a deadline for Chevron to compensate the city for the damage from the refinery fire, because of continued stonewalling by the company. Next up, a powerful and emotional moment. 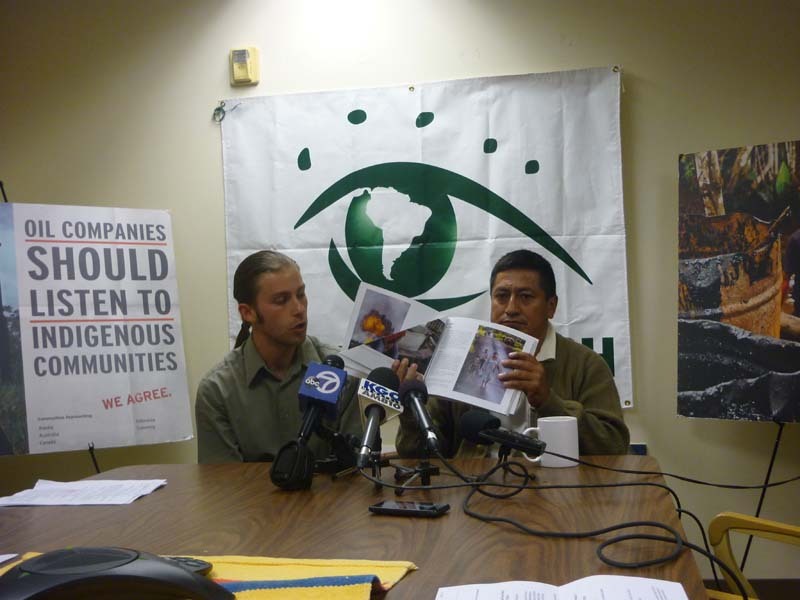 Servio Curipoma, a community representative from the indigenous communities suffering the effects of reckless oil explorations in the Ecuadorian Amazon, lost both his parents to cancer from the pollution caused by Chevron, then Texaco. Over three decades of oil drilling in the Ecuadorian Amazon, Chevron dumped more than 18 billion gallons of toxic wastewater into the rainforest, leaving local people suffering a wave of cancers, miscarriages and birth defects. 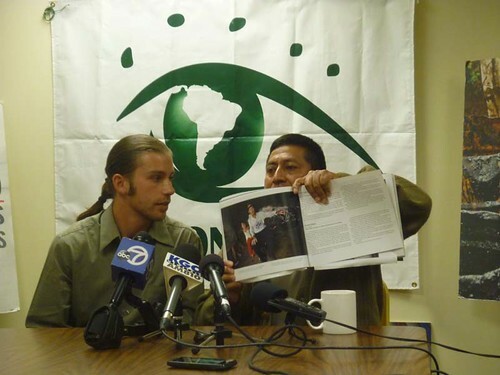 He told the story of how Chevron wanted to move the lawsuit to Ecuador because they thought they could easily bribe the judges, but since they lost the lawsuit they have refused to pay the $19 billions in reparations they owe and engaged 60 law firms, thousands of lawyers and billions of dollars to fight the judgement against them. 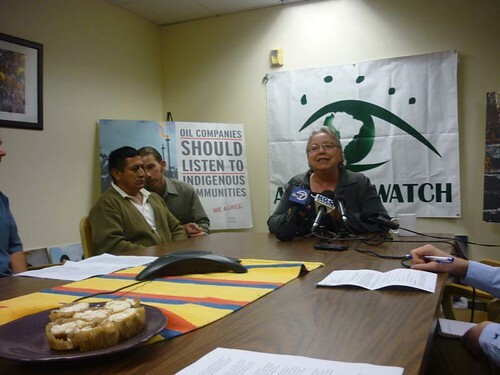 Next up was Shoshana Wechsler, who was representing the non-profit corporate reform group Public Citizen and warned about Chevron’s historically large and possibly illegal meddling in elections post Citizens United. She talked about Green Century Capital Management’s shareholder resolution asking Chevron to refrain from all election-related spending. ”They have an awful lot invested in the status quo: massive tax breaks and subsidies and full assurance that investigations into environmental violations will be friendly, not to forget their hefty government contracts,” Wechsler said. Then it was my turn to talk about Chevron’s role in accelerating climate change by subscribing to the untenable business model of burning as much fossil fuel as quickly as possible. I pointed out that not only is it completely irresponsible for Chevron to follow through on their business plan and wreck the planet for short-term profit, but that is actually a bad business plan. With an investment bubble in fossil fuels to the tune of trillions of dollars due to the fact that at least two-thirds of their oil reserves will have to remain underground if the world is to meet existing internationally agreed targets to avoid the threshold for “dangerous” climate change, they should really be shifting toward renewable energy right now. The fact that they aren’t only shows that they are putting all their stock into and are actively lobbying for inaction on those targets, which is simply morally reprehensible. Bike the Math is trying to give them positive reinforcement to do the right thing, for all of our future, including Chevron’s. Then it was Dr. Henry Clark’s turn. Dr. Clark of the West County Toxics Coalition has been a presence at Chevron’s Richmond gates for over 30 years, fighting for environmental justice for his community. 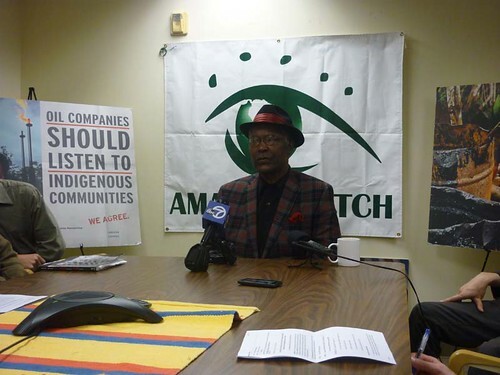 He pointed to an Environmental Justice Executive Order passed during the Clinton administration protecting low-income communities and minority communities from bearing a disproportionate burden of modern industrial life, saying that his community was already carrying a disproportionate burden when that order was passed and that they’re going to fight tooth and nail Chevron’s planned refinery expansion to process dirty crude disguised as an “upgrade” to the refinery. Closing the press briefing was Garo Manjikian, legislative advocate for CALPIRG, giving another look into Chevron’s expansion in the political arena with its largest ever super PAC contribution given by a publicly traded company, putting themselves at the vanguard of a new level of corporate interference with elections. So, as you can see, Chevron really embodies all that is wrong and ill with our system, and the only way to change them and thus the system is to get out there and make our voices heard. 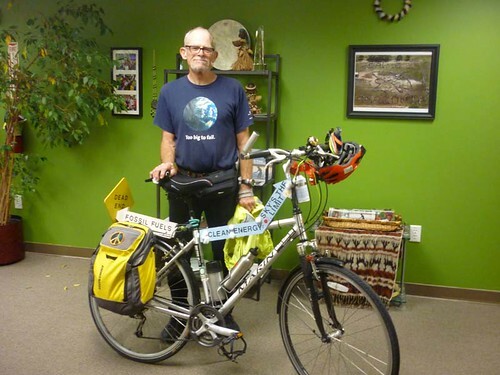 There’s nothing they fear more than having their corporate bullyhood challenged by democracy, so that’s why I’m getting on my bike tomorrow in solidarity with the brave people who are asking shareholders to fire Chevron CEO John Watson, and to bring my own renewable message to San Ramon. As they say, let’s roll! Chevron touts big oil profits = past. 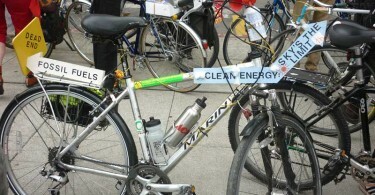 Cyclists generate people power = future. 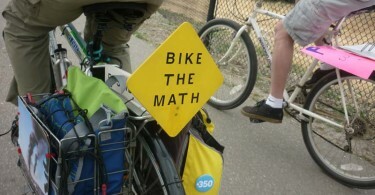 Bike the Math rocks! I hope you great success tomorrow. I hope you especially get the feeling that they at least listened to what you had to say. I’ll be with you in spirit and sending all the good vibes I can your way.